What and how do authors write off their expenses? What’s the process for writing off materials that I’ve purchased for writing your book. Are there categories on the tax return that apply and some that don’t? How do I know which tax deductions apply to me? Finally, How do I write off these expenses? If you sign up for my email list, you’ll receive a short ebook that explains tax deductions for writers. Go to TaxesForWriters.com and sign up in the lower right corner. Be sure to visit my Tax Prep Helps page too! There you’ll find a few short articles and probably most helpful, my Small Business Expenses Form. It’s a simple form I created for my tax clients to collect all their business expenses for tax preparation. 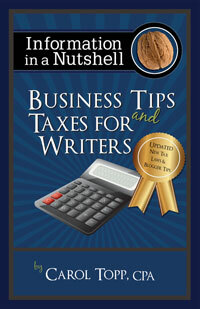 As for HOW to deduct your expenses, I explain all that in detail in my book, Business Tips and Taxes for Writers. It’s a lot to explain and my answer would depend on your business structure (sole proprietor, partner, corporation, etc). It’s more than a blog post can answer that’s why I wrote the book! You can order a paperback or pdf version here. What CAN you write off on your taxes…and HOW? Do writers as business owners pay taxes twice?